This Tuesday, the Cape Charles Rosenwald School Restoration Initiative (CCRSRI) closed on the purchase of the old Cape Charles Rosenwald School. Chairman of CCRSRI Tevya Griffin told the Mirror that the process began in 2009, and the initiative has been negotiating some way to purchase the historic building. With the help and gumption of some local investors, including Developer Eyre Baldwin, the financial capital plan came together. The building had been used as a seafood processing plant in the past, working mainly with bay eels. This posed a problem for the purchase, as most of the refrigeration equipment was left behind, and there was some worry that toxic chemicals may have leeched into the structure. A thorough inspection in December found no sign of trace elements, so the purchase was green lighted for January. Tevya Griffin told the Mirror that they are in the process of discussing future uses for the building. In a previous conversation, Baldwin told the Mirror that hope was to return the building to a functioning educational facility for everything from hospitality training to possibly high-tech. The board is already rolling up its sleeves and getting to work. Several grants are in the process of being completed. Once funding is secured, architectural and design work on the structure will begin, Ms. Griffin told the Mirror. The Cape Charles Rosenwald School Restoration Initiative (CCRSRI), a 501(c)3 non-profit, purchased the Cape Charles Rosenwald School on Old Cape Charles Road on January 22. 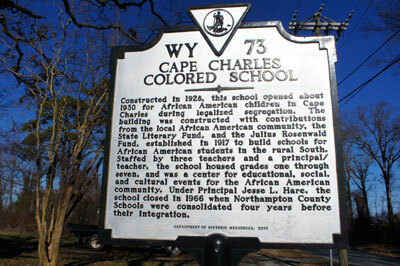 Nine years ago a group of alums and friends of the Cape Charles Elementary School formed CCRSRI with a goal to acquire and restore this wonderful historic structure that was a focal point and a center of social life for the African American Community in Cape Charles between 1928 and 1968. If you have ever driven into Cape Charles on Old Cape Charles Road or traveled between Bay Creek and the town proper, you would have seen the abandoned building a few hundred yards south of the overpass (“the Hump”). Beginning in 1912, the Tuskegee Normal and Industrial Institute (now Tuskegee University), Booker T. Washington, and Julius Rosenwald, a top executive at Sears Roebuck & Company, formed a collaborative to improve the quality of public education for African Americans in the South during the period of legal segregation. By the time the program ended in 1932, it had built nearly 5,000 schools. Julius Rosenwald and the Rosenwald Fund had contributed more than $4.3 million and the African American communities raised more than $4.7 million. At the time, new ideas about lighting, ventilation, heating, sanitation, instructional needs and aesthetics were bringing about changes in school design. The Rosenwald school program applied these new ideas to the rural South and created buildings that served as models for all rural schools. Many of the Rosenwald schools constructed between 1917 and 1932 remained in operation into the 1960s and 1970s when the 1954 Supreme Court ruling against racial segregation was implemented. Afterward, many fell into disuse or changed function as rural populations declined. The vast majority of the schools were clapboard construction and, although many are now gone, there is a growing interest in the history and preservation of existing structures. Several years ago, the National Trust for Historic Preservation designated Rosenwald Schools as one of the 10 most endangered historic entities. The Cape Charles Rosenwald School is very unique in that it is of brick construction. Although it was sold in 1968 to the Robberecht family to be used as a seafood processing plant and used for that purpose into the 70’s, it was not heavily modified and is in restorable condition. CCRSRI is now in the process of seeking a number of grants as well as additional contributions to continue with the planning phase of the restoration. If you would like additional information or to learn how to become involved, email capecharlesrosenwaldschool@gmail.com or call Tevya Griffin at 804-318-0607. INTERESTING ! I have passed that building for the past 5-7 years and thought “HOW SAD !” Please let me know any further news. This is such exciting news for Cape Charles, that an important piece of history will be dusted off and reopened. The exhibit last summer at the museum gave a fascinating insight into this school. I am especially intrigued and impressed that the Cape Charles Rosenwald School was not only made of brick (while the majority were frame), but it had an auditorium! Given that Mr. Rosenwald gave funding for half of the project, it is impressive that the community would have come up with matching funds to ensure these enhancements to the basic plan. Thanks so much for sharing this information! I appreciate you sharing this article about Cape Charles Elementary School. It was well written. However, it is devoid of a more intimate perspective. I attended Cape Charles Elementary School. There were a lot of committed teachers employed at this school and I developed extremely important relationships with my fellow students. Parenthetically, let us look at some of the other factors that were part and parcel of this school building, namely that this school was located adjacent to the dumping site for the township of Cape Charles. There were many days when we were not allowed to go outside to play because the trash burning and the resultant smoke was deemed too harsh for exposure; and yet, a lot of days we were allowed to go out to play in spite of the burning trash. Perhaps, I am not giving the kind of myopic perspective that needs to be rendered – our playground was next to the dump; interestingly enough for me the “Hump” led to the Dump. I take issue with the concept of the restoration of this ‘wonderful historic structure…and that it was the focal point for the African American Community – really. If that assertion is correct, then I must have been living in an alternative universe; and suffering from a form of co-morbidly that included delusions, hallucinations and some form of mass hypnosis. Time will not allow me to expound on any more of the ‘other’ facets associated with this wonderfully historic structure. In conclusion, I am thank/ full of the cogent reminder that ‘ beauty is in the eye of the beholder’ and that history can truly be lost, stolen or strayed. Note: Thank you for this perspective. Are you bragging or complaining? We visited Cape Charles for the first time last year, and the building’s fine brickwork caught my eye. I had feared it would fall victim to nearby development and looked it up when I got home. So happy that the local community is able to preserve this unique and exceptional historical community building. Out of all you saw on your first visit to this area, this ragged a$$ brick building caught your eye. If you want to see fine brick work, go to Williamsburg and check out the real deal Flemish Bond. Got a problem with ‘ Locals ‘ ? If so, please explain. If you don’t understand, well … it’s just par for the course. And just as I am speaking of the metaphor of home and hearth, this building once provided solid futures to young black Americans, who in any other circumstance, would not stand a chance in a world stacked against them. Julie you speak of the ragged, bleak look of a building once you entered Cape Charles. May I remind you, that twenty years ago, the entire area of Cape Charles was filled with blighted, ragged looking buildings that once housed hundreds of families. But for the fortunes of fate, a few entrepreneurial minds and a beautiful view of the bay, this town could have just as easily become the latest of ghost towns to dot our nation. But the resilience of the local people, the new found love from those that came from afar and the vision/deep pockets of a few to transform an area of fields and marsh to a neighborhood and golf course saved the town. Literally. It could not have been done on the assets of the townspeople alone. I assure you that. 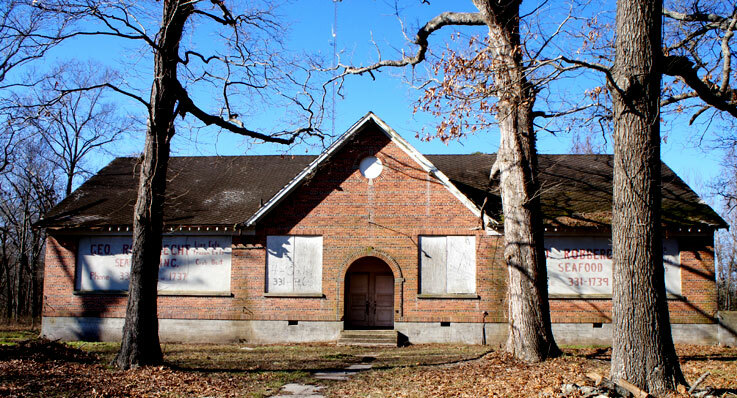 Just as this Rosenwald School was once the beacon of those who attended, it too shall rise from the dust heap of forgotten history. And I am astute enough to realize that this place, too, holds different perspectives to those that attended. But, make no mistake, without this school and its dedicated teachers and supporters, hundreds, if not thousands, of young black Americans would have been relegated to the fields, the grader sheds, deep, deep pockets and the welfare lines of the lower Eastern Shore. Forever beholden to the rich land owner farmers who daily dictated whether these folks had a job or a decent meal. And no, Julie, unlike you, who probably went to a fine white school with new books, modern labs (for their time) freshly scrubbed while taught all the rudiments a first class education had to offer, these poor folks were relegated to study next to a trash dump, with used books, slanted with history, far outside the confines of a town that scorned its own citizenry. Though most paid taxes to their town, they were not a part of the economy of that town, unless it was a far-flung grocery store or fabric shop that catered only to their own. The crushing poverty that was endured for generations may be lost on you, or perhaps you just don’t care. I don’t know. But, go, enjoy Williamsburg with its fine Flemish bond brickwork. Its beautiful old eighteenth century buildings and costumed actors portraying America in a better era. Did I say BETTER era? Ask those, whose ancestors were captured, forced at gun point and crowded onto slave ships. Who endured the middle passage, only to end up on these shores destined to live entire lives toiling for no economic benefit in agriculture and building infrastructure to a new nation (possibly Flemish brickwork in Williamsburg?) for white masters. I think you would find that Rosenwald stands heads and shoulders above, from their historic regard, than any other building that sits in Williamsburg. But, that’s just my opinion. You Sir, Are a Damned, Liberal Fool. WOW! Such vile words expressed regarding the renewal of life for the school. I am just a visitor from Arlington, Va. to Cape Charles about 3 times/year and as I have driven past the school I thought each time “HOW SAD” that the building sits there unused & isolated. It makes me happy that informed, caring and giving people are bringing it back to life. People have been coddled to a point where anything other than what they want to hear is offensive. Political correctness has brought this country to it’s knees. It is not a matter of ” what I want to hear”, it is a matter of how closed minded you are as regards the improvement of a historic structure in your town. What happened? Did you want to buy it and lost out, now you have a grudge? I feel sad for you and your narrowmindness. Interesting, Julie Parks. I write a bit of my own opinion (see last sentence of my comment) and you feel it necessary to ostracize and condemn me. The added link of an adult speaking to children (in reference to the Peanuts teacher speaking to Peppermint Patty vid – yes, I did click and watched. Funny, but not clever) only furthered your put down. I would be interested to know what offended you so? The matter, as I see it, is you have no tolerance for another’s idea or freedom of speech. You appear to be some sort of truth Nazi and are either 1. Afraid of new ideas. 2. Afraid of the truth. 3. Are so ignorant and thin skinned as to not be able to accept another’s point of view. I am guessing, all three. These past few years, I have watched conservatism take a dark turn. I have many, many conservative friends. I still remain good friends and frequently have intelligent, well behaved conversations with them. I do not consider myself a radical, left wing liberal. I do consider myself a liberal (progressive with an eye to the future and equality between the sexes, fairness and justice for one another and open to other belief systems and for a living wage for all who do an honest day’s work). I AM my brother’s keeper. That is my definition and my creed. If that bothers you, that is on you. I am proud of who I am, what I have accomplished and of my beautiful family. I am proud of my relationships (and that includes my conservative friends). I am proud of my knowledge and broad education. Of those two, I was most fortunate. I am not privileged (though, from my history and race – some would differ). I work hard, and I read frequently. I know Cape Charles well. I know the Eastern Shore, even better. And I can sincerely tell you this…and please listen. Many, many people, black and white together, who live there, have not had the opportunity to gather knowledge as I have. Many still live in the past and a false hope of returning to the good old days of segregation and limited opportunities for some. Many want a Bay teeming with four to five-pound flounder, twelve-pound Rockfish and seven-hundred-pound Sturgeon. Many disillusioned souls think pie in the sky is going to come to take them away to a magic kingdom somewhere. Still some others hold onto to the last vestiges of their kinfolk’s money like their world would end without it. Others believe the government will swoop in and save the day with walls against sea rise and the browning of America. But, trust me when I say this, none of this will happen. Ever. Our voices (yours and mine) have become a cacophony of white noise against a rising tide of world-wide discontent and a serious lack of moral fiber. We, as a society, have become mean. The world has become ugly. You, you are a prime example. Do you think you “hurt my feelings” by saying and doing what your comment intended? No, you did not. Hardly. You only looked foolish. Childish. Uneducated. Lacking in empathy. It would have been better if you had said nothing. Because, now, I have to come back at you with a vengeance. And I have. I am pointing out to you (and the rest who read this) what a narrow- minded bigot and small hearted NON-conservative you truly are. You don’t have a clue as to what true conservatism is. I don’t care if this cuts you to the quick. I don’t care what hornet’s nest I kick over. I don’t care who I offend (I don’t know you from Adam!) I am not threatening you. I am spot lighting your frailties, which loom large on the page here. I am sick and tired of small-minded people like you, hiding behind the curtain of conservatism (please read up on Barry Goldwater and others to learn what true conservatism is) and false moralism to condemn to shut down others who don’t agree with them. I am sick and tired of the idiotic clichés used (such as Libtard, Snowflake, Political Correctness) instead of a stout argument or rebuttal to try and put someone like me in my place. My place, as you can plainly see, is just this…putting you in YOUR place by using a straightforward and clear, concise reprimand. I am sure you get my drift. If this still sounds like Peppermint Pattie’s teacher or any adult in the Peanuts comics to you, then might I suggest a Miracle Ear. Or pull your head out of your a$$ and listen again. Read and re-read until what I am saying sinks in. Lastly, read this. Read something. Anything worth reading. Expand your mind. Get an education. Stop trying to be holier than thou. It’s not a good fit for you. And, most importantly, don’t ever call me a damn fool again. Ever. Planned Parenthood is the KKK rebranded and redirected. They’re a bit more subtle about it now, but it’s the same racism and same racist agenda. Margaret Sanger was clear about that. Very well said, Chas. Thank you for this and your other comments on this site. As a life-long resident of CC (50+ years), let me say I am happy to see this renewal and the recognition of the Rosenwald School and its students and devoted teachers and staff. You all have spoken proudly of your school and many of us in Cape Charles are happy to see this venerable building restored. Enjoy your memories of times there. We have all learned as the years have gone by and there is learning to come yet. There is a HUGE difference between the brickwork of Colonial Williamsburg, and the brickwork of the Cape Charles Rosenwald School. Besides the fact that they were constructed more than 200 years apart, the restoration of Colonial Williamsburg was done by the Rockefeller Foundation, while the restoration of Cape Charles has been done piece by piece, by people who had a vision for restoring this little town to what it was originally. I taught in a public school in Williamsburg, which opened in 1931 (just a few years after the Cape Charles Rosenwald School) and it has that beautiful Flemish bond brickwork….but it was built by the Rockefellers! I think when you put the Cape Charles Rosenwald School in context of the place and time, it is absolutely a remarkable piece of history. Just read up on what a typical Rosenwald School was like. Most were frame (which explains why so many are no longer in existence) and most did not have an auditorium. I would love to know who the local donors were, who made it possible for the Cape Charles Rosenwald School to be brick and to have an auditorium. The photograph of the students in costumes in this auditorium, which was on display at the Cape Charles Museum last summer, stole my heart! Truly, people in Cape Charles wanted the best that was available at that time for these children. Certainly, if the school were being built today, the shortcomings would be addressed. Thankfully, we have learned from that history. Thankfully, we had an amazing Virginian, Booker T. Washington, who shared his vision of providing and improving education for these students in the South with Mr. Rosenwald. I do look forward to how this latest Cape Charles “treasure” will be restored and used in the future. Maybe you people could have your governor put on a fund raiser….A Themed Costume Party comes to mind, I hear he enjoys it.